Jesus and the disciples were on what Jesus knew--and his disciples didn't know--was their last trip to Jerusalem together this side of the cross. They had stopped near the Mount of Olives and Jesus sent two of the disciples ahead to a village with instructions: "Go into this village. When you get there--as soon as you enter it--you'll find an animal tied near the gate. It will be a colt that nobody has ever ridden. Untie the colt and bring it here." Perhaps sensing their hesitation he continued, "If anybody wants to know what you're up to just tell them 'The Lord needs it' and they'll let you go." So, the two of them went ahead to the village and as soon as they entered the village they began looking around. It was just where Jesus had told them it would be and it was just like Jesus told them it would be. So, they began untying it when its owners stopped them asked, "Just what do you think you're doing? That's my colt!" Having seen Jesus proven right they decided to say what he had told them to say: "The Lord needs it." The owner consented and so they led it out of the village to Jesus. The disciples laid their cloaks on the back of the colt as Jesus stroked its nose. 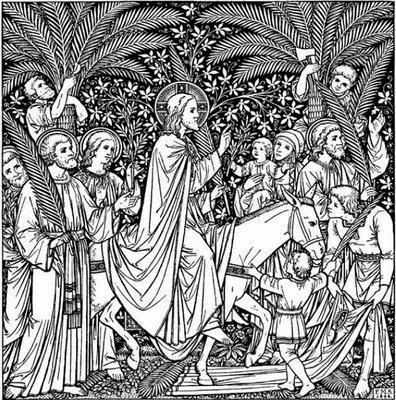 Finally, Jesus climbed aboard the colt and headed to Jerusalem with his disciples following behind him. Meanwhile, in Jerusalem, Pilate and a legion of soldiers were entering into the city on great white horses with standards and flags waving. Pilate would have been dressed as finely as possible to demonstrate the great pomp and royalty of the Roman Empire while thousands of Jews looked on with a mixture of awe and fear. This was their holy day but Rome was more than willing to insert themselves into it--after all, it was their kingdom and they could do as they pleased. So, here we have an image of Rome in all its glory and power riding into Jerusalem to proclaim its kingdom and Jesus riding toward Jerusalem on the back of a borrowed colt and surrounded by fishermen, tax collectors, and whores as he proclaimed a Kingdom entirely unlike Rome in every way--including its capacity to save the people. As he rode toward the town the people kept spreading their cloaks and garments on the road so that Jesus' borrowed colt would not touch the dirt. His disciples--many more than the twelve nearest to him--began singing songs of praise and joy as they followed after him. They sang, "Blessed is the King who comes in the name of the Lord God Almighty. Peace in the heavens! Glory in the highest heavens!" As always, there was some of Jesus' detractors among the crowd and they were opposing him at every turn--they didn't like Rome's kingdom and they couldn't see Jesus' kingdom. Some of the pharisees said to him, "Teacher! Order your followers to stop that nonsense! Not only are they blaspheming but they'll anger Rome." Jesus responded simply, "It doesn't matter. If every one of them were suddenly to become silent, then the stones would take up the chorus--this praise is fitting and right." The pharisees were furious but they realized they could do little to stop what was going on. 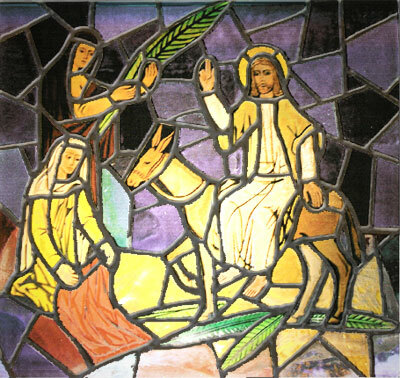 As they crested the last hill on their way to Jerusalem Jesus was looking forward with great expectancy. When Jerusalem's towers and walls came to his eyes, he began to weep and cry out to the city, "Oh Jerusalem! If only you had taken some time--even this morning--to understand the pathways that lead to healing and peace! But, now those ways are hidden from your eyes. Oh, yes, the day is coming when your enemy will besiege those gates and tear down those walls. That enemy you welcome in will close you in and crush you to the ground--you and all of yours. No stone will be left in its place. Destruction is coming and you didn't even recognize your salvation. Despair is making its nest among you and you have passed by hope without a second glance."